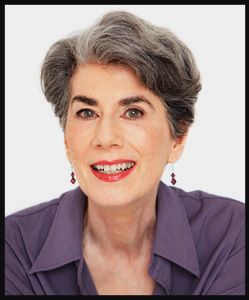 Nina Shoroplova - Editor, Actor, Healer, Author of Trust the Mystery: Questions, Quotes, and Quantum Wisdom. In 2014, the manuscript for my first book - Life Outside the Box: The Extraordinary Journeys of 10 Unique Individuals - was finished. Next in line was the editing process and my editor was none other than Nina Shoroplova! While we disagreed on things like the usage of pronouns, in the end the process honed my words in a way I could not have done on my own. Now my former editor is in the process of launching her second book - Trust the Mystery: Questions, Quotes, and Quantum Wisdom. With her upcoming launch on September 13th from 1:30-5:30 p.m. at Metro Theatre in Vancouver, this is the perfect time for me to turn the tables on her and do an author's behind the scenes Q and A. Enjoy! Where were you born and what were you like when young? Any interests or early signs you would later put pen to paper? When I look back on my childhood through 20/20 vision in 2015, I see a shy girl shopping with her mother who is holding a ration book, growing up in the aftermath of WWII in Cardiff, the small capital city of Wales. As with many children in those days who did not go to school until the age of six (kindergartens were rare), I already knew how to read when I started Grade One: my mother had taught me. In many ways, I followed in my mother’s footsteps. She wrote a weekly column for the Western Mail for many years: twenty, twenty-five years? The Western Mail was the main newspaper in South Wales. Her column was called “People and Places”; she was very sociable and attended all the local weddings and charity events so she could write about them. She belonged to the local amateur dramatics club—Cardiff Little Theatre—and brought that colourful world into our family lives with cast parties, play readings, and attendances at her many plays. Even though I became a writer and an actor like my mother, personality-wise, I was more like my quiet father whose hobbies included chess games by mail (talk about patience! ), fishing, and golf. Whereas Mum and my sister could be the life of the party, I am more likely to be observing from the sidelines. My mother died in January 2014; a huge loss. When my sister and I went through Mum’s papers, I came across two little “books” (each measuring no more than an inch by an inch and a half) that I had written, coloured, and bound with string during my first years at primary school. These were not school projects though; clearly, they were self-inspired. Amazing that she had kept them all those years. Amazing that the evidence was there, all those years ago. Can you share a bit about your journey to becoming a writer/published author? Was there a defining moment when you realized - I am a writer? In school, I always felt I could write well and was frequently disappointed by the marks I would get on my English essays. And so after high school, I ignored writing—I just didn’t even consider it—and I trained at Cardiff Royal Infirmary to become a physiotherapist. After graduating, I moved to Oxford to work in the Churchill Hospital. I emigrated to Canada in 1969, having secured a position (by mail from GB!) as a physiotherapist in the hospital in Penticton. A year later, I moved to Douglas Lake Ranch in the Nicola Valley, as the wife of the ranch manager, Neil Woolliams. Quite a switch from living in a city in Wales or England to living on a ranch in Canada. The road out of the ranch was unpaved, potholed, and dusty. It was thirty miles to Merritt to the southwest and sixty to Kamloops to the northwest. I decided to stay home and acclimate to ranch life. I had a large house to look after and I was unaccustomed to chatelaine duties. Bit by bit, I learned about my new home—Douglas Lake—Canada’s largest cattle ranch—and about its importance in the Nicola Valley, and in British Columbia at large. I became very interested in its history, despite the fact that history had been my least favourite subject in high school in Wales where history comprised lists of battles and kings and ancient buildings. This history was tangible—there were people still alive who had memories of the ranch’s early days, passed along to them through the oral tradition. I interviewed them and others I could find. I was entrusted with precious old stories and photographs. I began frequenting the Kamloops Museum and Archives, the Provincial Archives in Victoria, and the Museum of Vancouver. I corresponded with a retired, elderly English gentleman who had developed property later bought up by Douglas Lake. He shared some great stories. My skills at researching and my research quest rippled outwards. Gradually, I began using all I’d uncovered to write the story of the ranch. I spent my mornings writing and continuing researching to fill in the gaps in the story. But somehow, I still didn’t feel like a writer and only told people what I was doing on a need-to-know basis. Douglas Lake Ranch was then owned by Chunky Woodward, President of Woodward Stores, which at the time was still very much a going concern in BC and Alberta. Having no clue about what I was up to, Chunky brought in a published author to write a history of the ranch, and that was the point at which I had to tell Chunky exactly what I was doing. He was impressed with how far I had progressed. I think finally at that point I knew I was a writer and that “my book” would reach the market place. Douglas & McIntyre published Cattle Ranch: The Story of the Douglas Lake Cattle Company in 1979. It was a BC best seller (its first print run of 10,000 books sold out right away) and it was a runner up in the Eaton’s BC Book Award that year. It took me eight years to write that book, from first research to publication. Cattle Ranch was barely off the press when my first husband and I and our son and daughter moved to Australia to a property we’d bought, and our family of four expanded to a family of six, with the births of two more sons, plus sheepdogs, cattle, and sheep. Five years of drought later, we sold up and returned to Canada. Another five years later again, we separated and divorced. I found secretarial work in an engineering firm in New Westminster and that’s where I met my second husband. Long story short, Christian and I just celebrated our twenty-fourth wedding anniversary a few weeks ago. How do you approach the work of writing - specific schedule or? Do you ever struggle with writer's block and if so, how do you get past it? I love writing and I don’t ever struggle with writer’s block. And I love the organization that writing requires. My challenge is not so much procrastinating or struggling as getting through all the other tasks I set myself first, so my desk is clear enough to get on with what is always a pleasure—writing. One of the ways I managed to write almost daily on my second book was to write only on my laptop in our favourite local café rather than on the PC at home. Without my ever-present to-do list staring me in the face at the café, I was able to concentrate on writing. So my husband and I “went for coffee” quite regularly. He “takes the sun” outside and I write on my laptop, enjoying the feel of the keys plopping under my fingers and the sight of the words piling up on the page. The ideas (book title, subtitle, headline, chapter topics, etc.) for my next book are already fully formed. I even have 16,000 words written. But I don’t feel ready to continue writing that book yet because of where I am with my second book: Influence is publishing Trust the Mystery: Questions, Quotes, and Quantum Wisdom on September 7, and the all-important work of promoting my book will take precedence for a while. Once I am coming down the other side of the bell curve of promotional activities for Trust the Mystery, then I will start the enjoyable task of writing my third book. Meanwhile, the ideas for it continue to percolate on the back burner. Trust the Mystery has taken me six years. I’m hoping that my next book will take just four! Or less. I know you have several career paths in addition to writing - all represented by the S.A.G.E. logo on your website. Can you share with readers what S.A.G.E. stands for and a little about the other paths you pursue. Thanks for looking at my website, Marilyn. I really have to align my online presence with where I’m going. And that keeps me busy because I feel as though I’m evolving all the time. The SAGE acronym is new for me. Merriam Webster says sage means “wise through reflection and experience.” That seems right for the moment. After all, I’m nearing the end of my seventh decade of experiencing life and I’ve done huge amounts of reflection on my life and the lives of others. So, I must either be a sage or a slow learner. I hope I’m the first. S is for the word Spiritual. I’ve been on a spiritual path since the seventies, gradually allowing spirituality to take a more central part in my life. I recognize that I’m a spiritual being living in a physical body rather than the other way around. I struggle with religion and, while I am an active member of my local Anglican church (choir member, reader, healing minister, and past website manager), I have also explored other religions, philosophies, and practices. Currently, I am listening with heart to James Twyman’s daily A Course in Miracles Revival sessions (jamestwyman.tv) and to IANDS’ 2014 Conference main sessions (iands.org). IANDS stands for International Association for Near-Death Studies; I’m a co-leader of the Vancouver group of IANDS and I’ve signed up to livestream IANDS upcoming 2015 conference. A is for the word Author. Well, we’ve talked about that. G is for Guide. I truly feel that each of us is here on Earth as both a student and a teacher. There are always people whom we follow and people who follow us. For a while I worked as a Soul Realignment Practitioner, helping each client understand his or her specific path and purpose in this life. I was working as a guide, helping illuminate their path so they could see their way more easily. Trust the Mystery, my second book, is a testament and guide for being fully one’s self. I’ve written it as a series of personal anecdotes that demonstrate the tools we have for impacting our lives—our emotions, senses, feelings, chakra abilities, thoughts, decisions, plans, and actions—but the stories are so simple that readers will be able to use them as platforms to observe and reflect on their own lives and, thereby, to be guided to the next stepping stone on their personal path. E is for Editor. 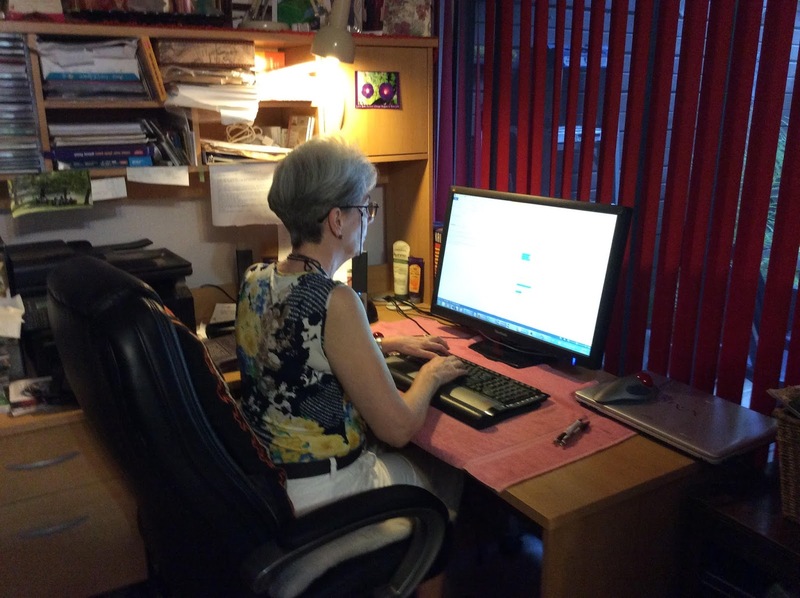 I’ve been editing other people’s writing since the 1980s, working as newsletter publisher, correspondent for the federal government, structural editor, substantive editor, copyeditor, proofreader, and writing coach. I’ve been with Influence Publishing as their senior editor for just two years, but in that time, I’ve edited (structural, substantive, and copy) and/or proofread or production edited over forty authors’ books. My absolute favourite task in book editing is structural editing: helping an author get the best out of their manuscript by showing them where the extraneous material is, where the story falls short or is unfinished, where it leaps across a chasm that will lose their reader, where the story is out of order, where it loses continuity. I’ve worked on spiritual books, inspirational writing, fantasy, business and financial books, nature and exercise books, nutritional and health books, and more. My strength is in the spiritual, inspirational, and self-help genres, but I love it all. I am curious if being a professional editor who has helped to polish and fine tune the work of other authors has changed or affected your own writing in any way? Working as an editor has certainly broadened my knowledge of the topics covered—as a substantive editor, I check every single fact presented by an author. For instance, did such and such an event really take place on that date and was that the actual name of the happening? And being steeped in the spiritual field myself, I am very much at home editing books in the spiritual, inspirational, and self-help genres. I share my learning with my authors and I learn from them in return. Has being an editor changed my own writing? It must have, but a clear answer to that is elusive. 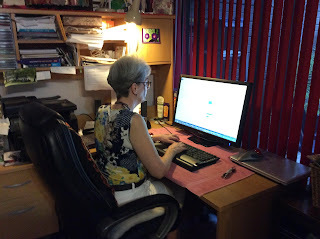 Whereas I used to work hard at dividing up my process of writing from my process of editing my own writing, I believe that now I can keep on my seasoned editor’s hat and gently edit as I write, looking for those pieces of extraneous material, repetition, chasms, and gaps in a story, and so on. I think I have greater awareness of the reader as I edit my own material. But it’s still way harder than editing someone else’s writing. 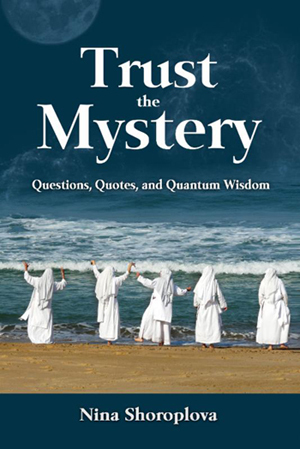 Please share with us about the launch for your new book Trust the Mystery: Questions, Quotes, and Quantum Wisdom on Sunday, September 13, 1:30 p.m. to 5:30 p.m., at Metro Theatre. Why did you choose to write it and what do you hope readers will take away from it? “The more we trust the mystery, the closer we align with our true nature.” That’s the one liner on the back cover of my book. And it’s as true about writing this book as it is about living life. Trust the Mystery: Questions, Quotes, and Quantum Wisdom. · at the quantum wisdom level, we are most surely connected with our wisest self who already has all the answers to all the questions we ever want to ask ourselves. · The quotes are there because someone else has always said what I want to say far better than I ever could. What do I hope my readers will take away after reading Trust the Mystery? A greater awareness of the integral nature of their role in life, in their community, and in their environment; the importance of their lives and how they are already where they should be, going in the right direction. With all you're involved with, what do you do to help clear your mind, relax and put a smile on your face? I spend time with family and friends, I sing, I act, I play bridge, I have a mocha at our local Blenz café. I write lists and ignore them so I can get on with something that’s more pressing. I make a routine of morning exercises and drinking lemon water as many mornings a week as I can. I manage to immerse myself in whatever I’m doing, so whenever the time comes up for the next thing, I find I’m having to tear myself away from whatever I’m doing. But soon, I’m immersed in the next thing. And on it goes. And I choose to be happy. I would love to close with a favourite quote if you have one. I heard this one again yesterday. Deepak Chopra says, “Be happy for no reason.” Great advice! What I take from this is that wherever we are in life is perfect: we are precisely where we should be, doing the right thing, with the right people. But often we struggle to be doing something else, somewhere else, in the future, in the past, anywhere but where we are. I want to accept and allow that where I am is perfect; I want to trust the mystery that is the perfection and the potential that energizes life.